These Cider & Sausage Stuffed Mushrooms can bridge that gap from casual to chi chi with their sausage and cider flavor…there’s a little apple in there, too, and then they’re topped with the herby breadcrumbs. (Mix those breadcrumbs with a bit of grated, hard cheese if you want.) A bite of my Cider & Sausage Stuffed Mushrooms makes me imagine I’m tasting something from the Normandy countryside. I don’t know about you, but a few years back I fell in love with apple sausage when it started appearing in the stores. First, it was in the fancier stores and farmer’s markets under artisanal labels, but by the time it came full round and the idea was picked up by the larger producers and available at the grocery store, the taste just wasn’t as distinctive. These mushrooms, made with plain old breakfast sausage with its sagey flavor (go hot or mild, whichever you prefer) and cooked up with apple and apple cider are really going to bring it in the flavor department. Each of these little Cider & Sausage Stuffed Mushrooms is like a small bite of heaven. You might want to make even more than you think you’ll need for a party because they’re gonna go fast. I think even those that might be lukewarm about stuffed mushrooms will like these babies. And if they don’t? Ha! More for you. 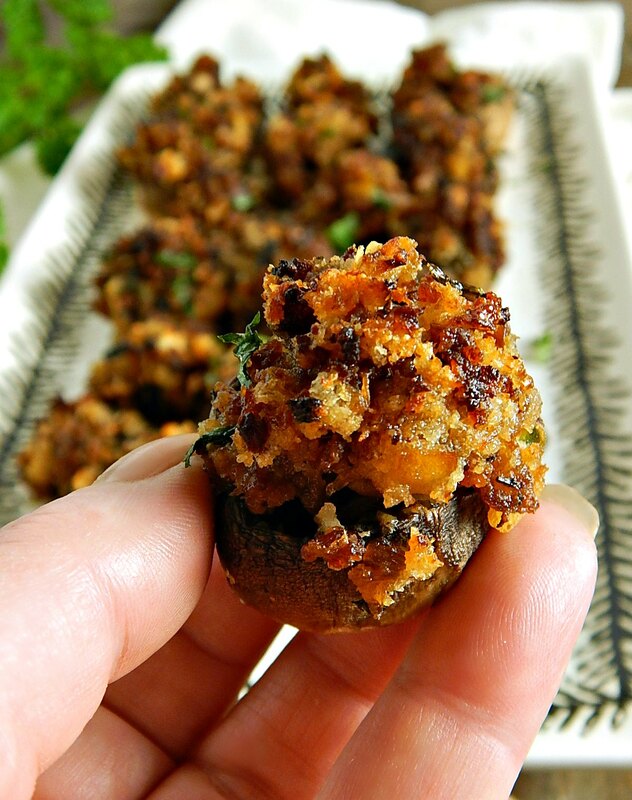 Did I just say that “out loud?” Seriously, stuffed mushrooms are a pretty familiar appetizer and these are just different enough (and delish enough) to really stand out. I like these stuffed mushrooms either way, with a little cheese in the breadcrumb topping or without. The stuffed mushrooms themselves have just a bit of sweetness from the apples, so a good Parmesan or sharp grated cheese can balance them out. It’s your call. Maybe you’ll want to make some of each. All mine, here on this page are shown without cheese. Since, as I mentioned, the Cider & Sausage Stuffed Mushrooms have a sweet undertone, use a good, tart apple cider with a bit of a tang if you can. That will keep the mushrooms from being too sweet. Maybe a hard cider would work, too, although I haven’t tried it and only now just thought of it. If all you can get (which is often the case here in the twin cities) is plain old grocery store cider in the plastic jug, add a teaspoon of vinegar, apple cider vinegar or white or white wine vinegar to offset that sweeter cider. There’s really not too much to making these. I use a small scoop to top the mushrooms so filling is a breeze and I just pile that filling on. I actually like using the smaller grocery store white button mushrooms because then each one is a perfect little bite but you can go with a fancier one if you’d like. Button mushrooms are fine here and since I’d rather use buttons over the grown-up cremini, bonus! Buttons are going to be less expensive. I watch the sale prices and do more with mushrooms when they’re on sale, and they often are on sale around holidays. Since around the holidays is usually when I want to make something like a special little appetizer like this, everything kind of falls into place. I love that this recipe fancies up plain old breakfast sausage, another item I look for on sale. It’s usually in my freezer section (and if it’s in the refrigerator section, at my store anyway, I can tell the store just took it out of the freezer. Sometimes it’s still half frozen!) so it’s a great item to pick up on sale and chuck in the freezer till you need it. Cider prices will vary depending upon season and quality. Even when I’m on a budget, I do love a good, tart cloudy apple cider and look for it every fall (and of course, it’s always a fun outing to take a drive in the countryside and pick up some at an orchard) but I know that’s not for everyone! Watch for sales at the store, or maybe look for it at the farmer’s market if you go. Sometimes the farmer’s market prices are much lower than you’d expect. It just all depends. Remove stems from mushroom, slice off the hard end & discard & finely chop the rest and set aside. With a spoon or melon baller, carefully clean out the insides of the mushrooms and discard gills. Take a small slice off the top of each mushroom so it will stand up nicely without wobbling when turned over to be filled. Add oil to a small skillet, add the sausage, the chopped mushroom stems, apple and, onion, cooking until vegetables are tender and sausage is brown. Add the apple cider and the apple cider vinegar or brandy and continue to cook until nearly evaporated. The bottom of the skillet should look just a bit wet but there should be no pooling liquid. Turn off heat and lightly mix in parsley and breadcrumbs, season generously to taste with salt and lots of black pepper, keeping in mind that the seasoning is going to flavor the mushrooms as well. If the mixture seems too sweet, add a little more vinegar or brandy. Mixture should not be wet, but breadcrumbs should look moist. Drizzle with a touch more cider if needed. Scoop or spoon a scant teaspoon to a tablespoon of the stuffing, depending on the size of the mushroom, into each mushroom, mounding the mixture up. Place on a parchment-lined rimmed baking sheet. May be made several hours ahead and refrigerated, covered. Preheat oven to 350 degrees. Drizzle very lightly with a touch of olive oil, if desired. Bake until tender, about 25 minutes. On cheese: If desired mix a little cheese into the breadcrumbs. I’ll be sharing my Cider & Sausage Stuffed Mushrooms at Fiesta Friday #250, cohosted this week by Jenny @ Apply To Face Blog., Jess @ Cooking Is My Sport, Jhuls @ The Not So Creative Cook and Judi @ cookingwithauntjuju.com. Thanks, guys for hosting for us for so many Fiesta Fridays! #250 is a landmark for sure! This entry was posted in Click here for Fabulous Food Posts and tagged Appetizer, Apple, apple cider, brandy, breadcrumbs, mushrooms, Pork, Sausage, stuffed mushrooms, Vinegar. Bookmark the permalink. Stuffed mushrooms are a favorite here, but we usually stick to cream cheese based fillings. These look like a fabulous way to change it up! Very nice, Mollie! Btw, you’ll be cohosting tomorrow with Monika @ Everyday Healthy Recipes. I hope that doesn’t come as a shock. Time flies!! Thanks Angie, and thanks for the reminder! I’m happy to be cohosting!! Hope you had a Happy Thanksgiving! It sounds a bit like my holiday stuffing recipe but without the raisins. I bet these are delicious, a big hit at a party. I would like larger ones for dinner. I can just imagine, Jhuls! 250 weeks. It kind of blows me away!! Thanks for hosting and happy FF!! The stuffing sounds really good (I like apple sausage too) but I would have to put them in some kind of pastry cups. Never have been a mushroom fan except for enoki mushrooms I first had while in Hawaii 🙂 Thanks for sharing your delicious appetizers perfect for any family/friend gathering. Happy Fiesta Friday! Hi Judi, and thanks for hosting! I think you might be the opposite of most people because you go right for the gourmetmushrooms! That’s a good looking stuffed mushroom you got there. One sure to please your cocktail party goers. You know we’re all about pork here, but fresh breakfast sausage doesn’t exist. But, you know me, I love mushrooms, pork and apples so, I’ll just have to make my own as I’m serving these at our Boxing Day dinner. How wonderful! I tried homemade breakfast sausage a couple of times and had some trouble, but I think it was all about our much leaner pork…but then the apple would help out, too!